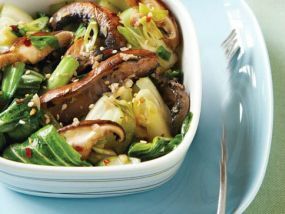 Stir Fried Bok Choy and Mushrooms is a Cambodian Food Recipe cooked with garlic and ginger. Heat oil in heavy large skillet over high heat. Saute ginger and garlic 20 seconds. Add bell pepper and mushrooms. Sauté until pepper is crisp-tender, about 3 minutes. Add green onions and bok choy. Sauté until just wilted, about 2 minutes.